Ep 93: Floozy cardy & kits! This week on the podcast we are talking all things FLOOZY!! I'm joined by the very gorgeous Catrien from Yarnfloozy to celebrate the launch of Floozy cardigan; my design and Catrien's beautiful yarn. We're chatting about how Floozy came to be and what inspired the colours we came up with as well as how to choose a size, techniques that we've enjoyed and the variety of options available in the pattern. Catrien has created some beautiful colourways for your Floozy cardigans and you can grab a kit off her now. Just head over to www.yarnfloozy.co.nz to choose yours! What will it be? Traveller, Dreamer or Still Waters Run Deep! There's a flat rate for international postage but be quick! I think they'll fly out the door. The pattern is available now on Ravelry as a pre-order. Use the code FLOOZY for a 15% discount. As I explain in the video, this week you'll get everything you need to choose a size, yarn and start swatching. In two weeks our grand Floozy KAL begins in the Truly Myrtle Ravelry Group and the full pattern will drop and will be added to your Ravelry Library on 17 August 2018. Who's joining us?! We're going to have a ball. 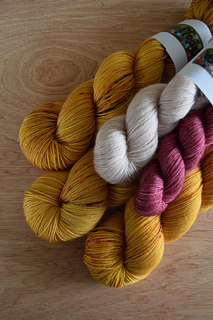 Check out the gorgeous Yarnfloozy colourways below.